Technology is developing and emerging in such a way that it is less likely to disappear anytime. With the benefits of technology, it is expected to see growth in the educational system as well. Innovation in the mobile and digital technology space is creating a marked impact on education, especially on the self-learning and self-improvement side. Such technological developments have the possibility to change the way students learn and teachers teach. However, most educational centers are still wrestling with the idea of using iPads and mobile phones inside the school premises for learning and communication. Coupling mobile phones with innovative ideas utilizing the Internet of Things (IoT) and iBeacon technology opens a bulk of opportunities and makes the learning experience far more exciting. The effectiveness of lesson planning and education have a drastic change through years. Students and their ability to deliver educational goals are being more focused and has become more important for instructors to connect with every student. The issue that soon became obvious is that all students do not learn or illustrate their knowledge in the same way. Due to that reason, most educational standards require a system to personalize and feed lessons to each student in order to improve their learning ability. One of the largest components of technology in our modern time is the notion that it shortens attention span or decrease from our ability to contextualize that we learn in our daily lives. Beacon technology delivers a solution for this downfall when used correctly. The era of technology has various benefits that will serve to overcome the difficulties of initial integration in the long run. Along with the support of education technology, educators can convey a further level of interest towards education and serve to better integrate students with the learning process. There are sky limits to what education technology can do. Schedule Daily Class easily: Beacons can make things accessible for students on a regular basis. Schools can execute a beacon-enabled scheduling system that can push notifications to students on the classes scheduled for the day while they enter the classroom. This can give students a heads up to what classes to attend. It is possible that the similar system can send notifications on the details around a class such as the lessons scheduled for the day or the teacher conducting the session before the class begins. Automated Attendance: Taking class attendance becomes easier through Beacons. 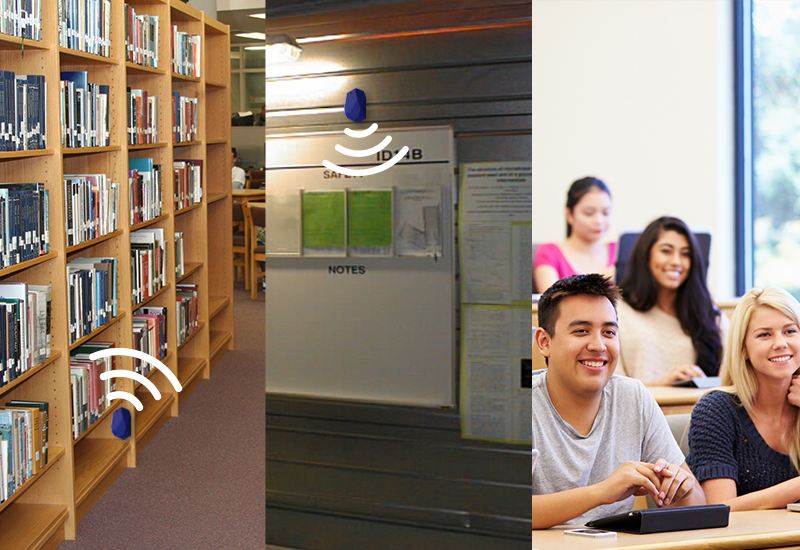 With the right applications, a beacon placed in the classroom can pick up signals from the smart devices of the students entering the class. This way, it tags the students that are present on a particular day in a particular class. Thus, the time-consuming attendance procedure can be cut down by a considerable time duration. Stay updated with Event Calendar: Beacons can help by notifying for upcoming activities or events held by a particular department to the student’s device just they enter into that department. Students can also check in at any of the events where an attendance requirement tags along. Total Control over locations’ Access: Beacons can be used to restrict device access at different locations. When a teacher enrolls with beacon, all student devices having the textbook applications, are restricted to the textbook application only. Campus Tour without personal Guide: To Track buildings in new campus is an arduous task. The students who are new to the college, need to get familiarized with the campus. Beacons will help the students to self-guide tour around the campus, enabling them to take their time understanding the surrounding of the campus. The beacon placed around the campus will assist students to track the buildings. Don’t get lost in library, Easy to search Interest: The main purpose of a library is to entice people into reading. In the library, Beacon technology is useful by deploying at a particular book section and can trigger relevant notifications based on the types of books available in that section. Notifications might include popular books of the same genre, new collections, etc. Why to stand in queue at cafeteria: Students often spend a lot of time waiting in long queues outside the cafeteria. Beacons are placed at common locations in the university to send a notification about a particular cafe being ‘overcrowded’ and even when discounted meals are being offered. Beacons makes Material distribution faster: When a guest speaker is interacting with the students, the paper-based material distribution becomes messy and takes a lot of time. With the help of beacon, the materials can be distributed when the speaker refers to it. It will also encourage students to pay attention to the reading material creating higher learning value. Hence, above benefits showcase how beacons can solve a number of problems at universities and schools to make the students’ experience more fascinating and technologically better. This system aids instructor to further personalize their education method and technological support issues from IT Staff by handing over a simple solution for collaboration that demands nothing more than an internet connection and a device. 9series is a box of complete IT Solutions with suggestions to enhance business profits.